A sobering chaser to the apocalyptic swill of 2012, the film adaptation of Cormac McCarthy’s The Road has the good taste to not turn mass destruction into bread-and-circuses spectacle, and the integrity to recognize that when the world comes to an end, the world actually comes to an end. Whatever hopefulness can be drawn from McCarthy’s unrelentingly bleak vision comes from our will to survive when all is lost and humanity is shuffling toward extinction. In that sense, The Road is something like a zombie movie, as father and son traverse a landscape filled with emaciated marauders whose compassion and decency have been supplanted by raw need. Needless to say, their journey is dangerous, but it’s haunted further by the reality that salvation likely isn’t waiting at the end of the line. Turning McCarthy’s novel into a palatable feature film couldn’t have been easy, but director John Hillcoat (The Proposition) and cinematographer Javier Aguirresarobe supply some arresting images of an earth that’s literally dying, shrouded in ash and littered with the artifacts of an unthinkable (and unspecified) human tragedy. 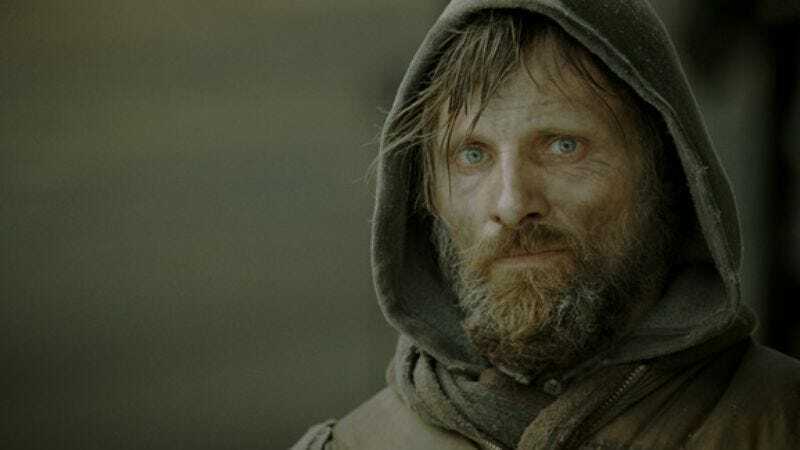 Viggo Mortensen and newcomer Kodi Smit-McPhee also acquit themselves nicely as a strong-willed father and son who trudge across this barren country in search of food and shelter while dodging bands of cannibals. The constant threat of death, whether through slow starvation or an attack from savages, should sustain a low-level tension throughout, but The Road is mysteriously flat, meandering from episode to episode without giving them much individual life. Hillcoat gives the film a remarkably evocative backdrop, but the drama lacks depth and dimension, and the scenes tend to blur together. And as grim as The Road gets, Hillcoat goes a little soft at the wrong time. Someone like Michael Haneke would have no trouble embracing this material’s uncompromising dreariness—in fact, Haneke already did his own post-apocalyptic film in Time Of The Wolf—but Hillcoat allows the hard-won emotion of the final scene to veer decisively into sentimentality. (Points off for Nick Cave and Warren Ellis’ disappointingly mawkish score, which tips the balance more than it should.) The Road honors McCarthy’s book with haunting pictures of the future’s end—the persistent thud of dead trees crashing to the ground is particularly chilling—but they tend to overwhelm the drama in the fore.